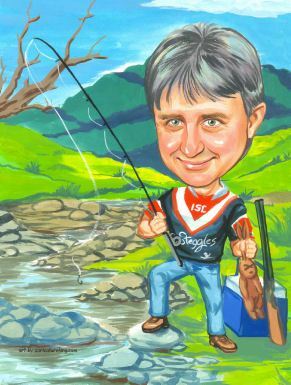 Looking for a fishing related birthday gift with a difference for a keen fisherman? 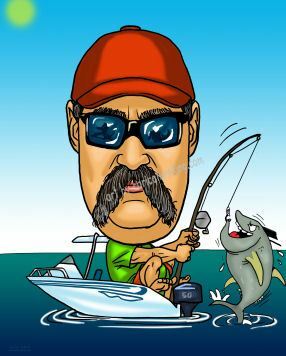 It's hard to buy fishing gear, because it might be wrong and it is hardly worth getting anything else, because....well, they are fishermen (and fisherwomen of course). 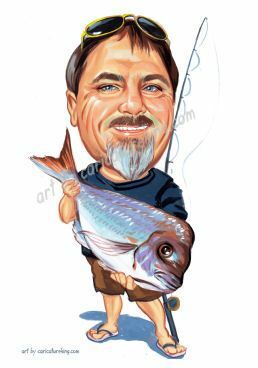 A perfect personalized birthday gift is a custom caricature of your fisherman with their big fish that our artists draw from photo. 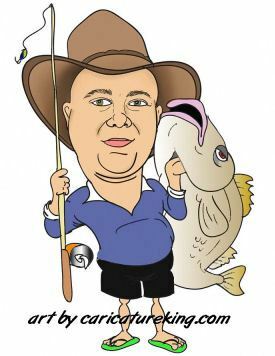 If is truly a custom gift that imortalizes their fishing passion! 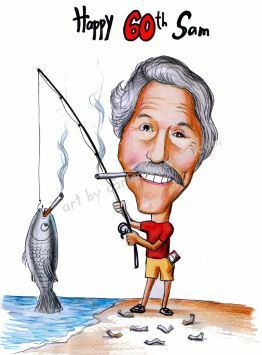 It could feature their much loved boat, or perhaps that biggest fish they have ever caught...or are yet to. You can always help them dream! 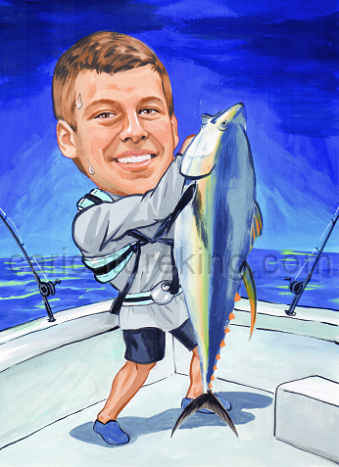 As many fishermen also like other sports and interests, we can also incorporate that into the fishing caricature. As our samples show, we can put a sporting team jersey on them if required. 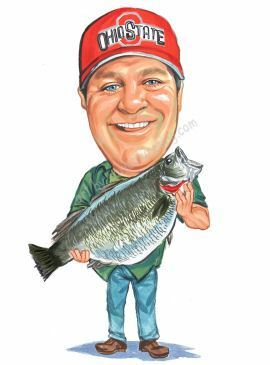 It does not matter if the subject of the fisherman caricature gift likes fly fishing for trout, beach fishing or chasing big game fish from a boat! 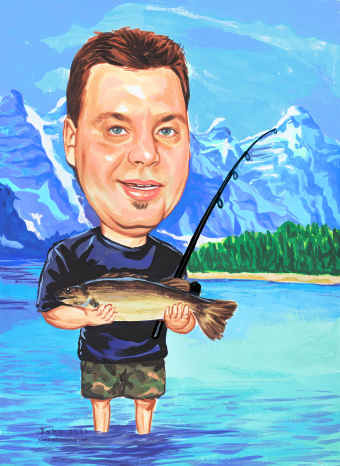 Our caricature fisherman gifts start with ideas, not templates. Your art is 100% custom and based on your wants! We can help with ideas and then start from a blank sheet to tailor-make your bespoke artwork. 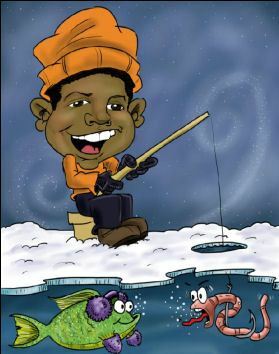 The fishing caricatures below are just some examples and from only some of our artists. 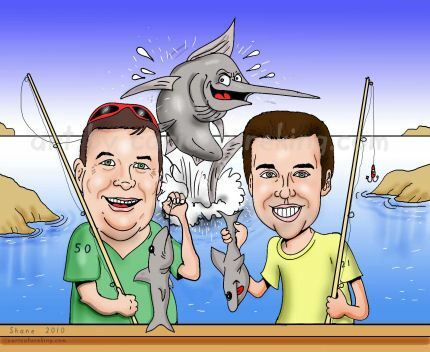 Any of our caricature artists can create art for you. 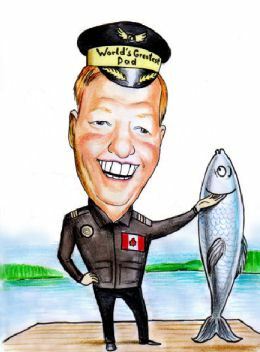 We know getting the fisherman gift just right is important, therefore is in doubt about anything prior to placing your order feel free to email Matt with any questions. Browse our artists to see who's style you like best and then click the flag for the currency for your location. Complete the order and email us the photos and instructions (email address is included in the order confirmation email).